You’ve read the descriptions. A gentleman in the early nineteenth century sports a snowy cravat, and all the ladies go into raptures. I had to become more acquainted with the cravats when I began writing Regency romances. But I didn’t really appreciate them until I created and wore one myself. A cravat in early nineteenth century England was a square or rectangle of material, most often linen but occasionally cotton. I have seen mentions of silk versions, but I do wonder how well they would survive the maintenance process (more on that below). Cravats were wrapped around a gentleman’s neck, usually outside the shirt, forcing the points of the collar upward. You may have seen mention of gentlemen who piled up the folds so high they endangered their ears or eyes with their shirt points. The color of your cravat was as important. This was an era of lye soap and hand-washing. Imagine trying to keep something snowy white. So, if you had a white cravat, it either meant you could afford a talented laundress or you were rich enough to simply throw the things away if they soiled. Then too, some gentlemen chose to wear colored cravats, particularly if they were a member of the sporting set. Famed boxer Jem Belcher preferred a patterned cravat, the print resembling peacock feathers. Everything I can find suggests his favorite was blue on navy, but the portrait of him in the National Portrait Gallery shows yellow on russet. Either way, he makes the case for colored cravats. The laundry process is one of the reasons that I question the use of silk very often. The other reason is that cravats were heavily starched to hold up to the intricate folds some gentlemen preferred. You’ll see mention of valets who handled the cravats too roughly and made them limp, preventing the proper fold. And you may well have needed a valet for assistance. Cravats are surprisingly long—up to five or six feet! Trying to fold, wrap, and tie it appropriately could not have been easy at first. It certainly wasn’t for me. 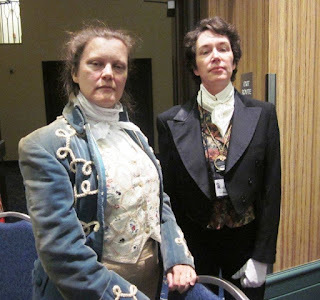 As I have mentioned, I decided to impersonate a Regency gentleman for a soiree of the Beau Monde, the Romance Writers of AmericaTM chapter for those who write Regency romances. [We never have enough gentleman for a dance set.] To prepare for the part, I made my own cravat. Mine, alas, isn’t as snowy white as that of Sir Carolus here (AKA the marvelous Cara King), but then neither is the shirt I found. I fold the cream-colored rectangle in half, wind it around my neck, then tie it so that a piece cascades down the front and is affixed in place with a cravat pin. I am invariably asked what my fold is called. The graphic above was an 1818 satire on cravats, but the particular folds did appear to have names. I call mine the Incomparable, although I nearly called it the Incompetent because it’s so hard to tie! For more information on how to tie a cravat, see the Historical Designs website or this tutorial by my friend and accomplished author, Kristen Koster.